The Russian Journal of Applied Chemistry (Zhurnal Prikladnoi Khimii) covers all application problems of modern chemistry, including the structure of inorganic and organic compounds, kinetics and mechanisms of chemical reactions, problems of chemical processes and apparatus, borderline problems of chemistry and applied research. The journal was founded in 1928. 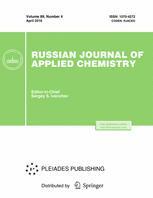 Russian Journal of Applied Chemistry (Zhurnal prikladnoi khimii) covers all application problems of modern chemistry including the structure of inorganic and organic compounds, kinetics and mechanisms of chemical reactions, problems of chemical processes and apparatus, borderline problems of chemistry, and applied research. Academic OneFile, Academic Search, CEABA-VtB, ChemWeb, Chemical Abstracts Service (CAS), Chemical and Earth Sciences, Chimica, Current Abstracts, Current Contents/Physical, EBSCO, EI Encompass, EnCompassLit, Gale, Google Scholar, INIS Atomindex, INSPEC, Journal Citation Reports/Science Edition, OCLC, Reaction Citation Index, ReadCube, Reaxys, SCImago, SCOPUS, Science Citation Index Expanded (SciSearch), Summon by ProQuest.